I am also taking a set of courses on Big Data and Machine Learning (ML) from the University of San Diego via Coursera. Every morning I get up at or before 05:00 AM and spend a couple hours studying. For me it works better to take a class with graded quizzes and assignments than to read a book and solve some of the problems (if any) at the end of each chapter. 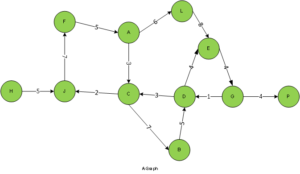 I used Visio and created the image for the graph. The actual adjacency matrix is in the main() function in the code. * Display shortest paths from the specified root. I then spent some time comparing the results generated by the program with some CYPHER scripts in order to verify the execution of the Java program. SYPHER is the scripting language for Neo4j. Not as simple as SQL but with a little practice you can become somewhat proficient in a week or so. Following are all the runs for the CYPHER scripts and their text results. Neo4j also produces graphic output for each table. In my case I was interested in the results which matched in all cases. If you have comments or questions regarding this or any other post in this blog, please leave me a comment and I will reply as soon as possible.